I carry thread, needles and a tonne of safety pins. I keep them in a tiny little compartment in my toiletry kit and it’s my favourite secret weapon. Why bother with a sewing kit? I can’t bear to throw away my favourite clothes just because they’ve got holes in them. I’m travel with just a backpack so everything in there is everything I need and want, they’re my absolute favourite pieces that I might actually cry over if I lost. It saves you money. Repairing instead of buying new saves you money. Think about it: a new pair of socks could cost the same amount as a cheap lunch. You can decide which is better for you but I prefer spending my money on food than buying new socks. So far, I’ve repaired Uniqlo’s heat tech socks (that were perfectly brand new but couldn’t deal with my hardy boots, disappointing) and my 2 year-old well-loved dark blue Massimo Dutti top, and my Totes bag. The pockets of my jeans are next. 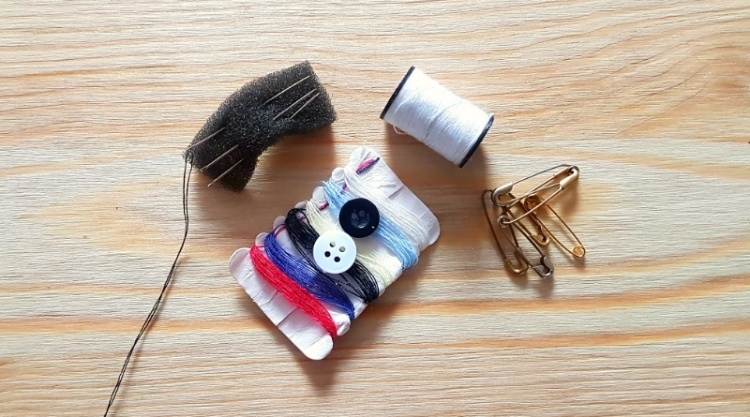 Remember, the next time you come across a tiny sewing kit in a hotel bathroom, take it and keep it for rainy days.